Draft: 2010, Florida Marlins, 3rd rd. 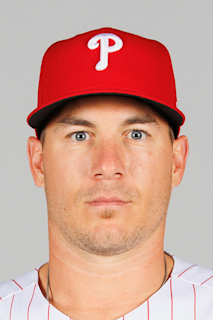 Jacob Tyler Realmuto (pronouned reel-MOO-toh)… Married Alexis Taylor (11/4/17)… Has one daughter, Gracie (7/10/18)… 2010 graduate of Carl Albert High School (OK), where he played baseball, basketball and football and won two state championships in both baseball and football…Hobbies: Racquetball, hunting, fishing and ping-pong…Signed by: Steve Taylor. Ranked 1st in at-bats (477), runs (74), hits (132), doubles (30), AVG (.277), SLG % (.484) & XBH (54), T-1st in RBI (74), 2nd in HR (21) & OBP (.340) and T-3rd in triples (3) among all NL players whose primary position was catcher...Named to his first career NL All-Star team (0-0, R, 2 BB)...Won the Silver Slugger Award for NL catchers...Set career highs in runs, HR, RBI, walks and OPS (.825)... Slashed .298/.360/.515 in 413 plate appearances vs RHP... Began the season on the DL while recovering from a low back contusion sustained during spring training... Had a rehab assignment with Jupiter (A), 4/14-16, before being activated on 4/17...Posted an .894 OPS over his first 80 games of the season (4/17-7/31)... Had two separate career-high 12-game hitting streaks: 4/20-5/4 (.340 AVG) and 6/18-7/5 (.340 AVG)...Collected a career-high 5 hits, 7/8 at WSH...Batted .296 (29-98) with RISP...Started 111 games at catcher and 8 at 1st base...Following the season, was part of the MLB Japan All-Star Series (.176, 2B, 2 HR, 4 RBI in 4 games). Finished season with career highs in games (141), runs (68), home runs (17), RBI (65) and walks (36)...Recipient of "Mr. Marlin" Award, as voted on by the South Florida chapter of the BBWAA...Ranked second in MLB in hits as a catcher (133), first in runs (64), tied for first in triples (3), third in games (126), sixth in average (.274) and tied for sixth in RBI (58)...Ranked fifth in MLB with 21 runners caught stealing, and ranked third with five catcher pick-offs...Ranked seventh in National League (13th in MLB) in road average (.317/96x303)...Hit first career walk-off home run on September 19 vs. New York-NL; marked second career walk-off hit (other, RBI double on April 14, 2017 vs. New York-NL)...Hit second career inside-the-park home run on August 24 at Philadelphia, the 18th in Club history and first since he also did so on Sept. 8, 2015 vs. Milwaukee...Recorded second career multi-home run game on July 22 at Cincinnati, first of season (2 home runs)...Had 15-game hitting streak on road (.379/22x58) from April 18 to May 23; was longest by a catcher in Club history...Set career high with 18-game on-base streak from May 18-June 10; hit .286 (18x63) with five doubles, a triple, three home runs, and nine RBI, and reached base at .400 clip. Finished season with 268 hits, 52 doubles, and 21 home runs in first two full seasons as a catcher (excluding stats from his 11 games in 2014)...According to STATS LLC, was just fifth catcher in MLB history to reach those plateaus in first two full seasons as a catcher, joining Johnny Bench from 1968-69 (311 hits-63 doubles-41 homers), Benito Santiago from 1987-88 (286-55- 28), Kenji Johjima from 2006-07 (286-54-32), and Russell Martin from 2006-07 (275-58-29)...Stole 11th base of season as a catcher on September 24 (12th overall); the 11 set a new Club record for a catcher in a season, breaking tie with Ivan Rodriguez (2003) and Benito Santiago (1993)...Finished year with 19 steals as catcher for career, a new Club record; set mark with 12th career SB as C on June 23 vs. the Cubs, passing Benito Santiago (11)...Led National League (second in MLB) in road batting average (.352); was third-highest mark in Club history...Hit .303 overall for season, ranking 12th in NL, 21st in MLB...Batted .301 as a catcher, ranking fourth in MLB behind Wilson Ramos (.309), Yadier Molina (.308), and Jonathan Lucroy (.306); that set new Club record, surpassing .300 mark by Ivan Rodriguez in 2003...On April 24 at San Francisco, tied career high with four hits; would reach that mark three times on the year...Recorded 200th career hit on July 1 at Atlanta...Had a hit in seven straight at-bats on July 3 & 4, one shy of tying Club record; had a hit in seven straight plate appearances before walk in 8th inning on July 4...On May 3 vs. Arizona, was first catcher in Club history to start in leadoff spot. Did so in four games on that homestand, and 23 times overall, batting .330 (32x97) with 19 runs scored, seven doubles, a home run, and seven RBI...Had career-best 11-game hitting streak snapped on August 10 vs. San Francisco...Had career-long 17-game on-base streak snapped Aug. 18 at Cincinnati. Was named team Rookie of the Year by South Florida chapter of the Baseball Writers Association of America, and was named to Topps MLB All-Star Rookie Team...Was recalled from Triple-A New Orleans on April 13...Set the Club single-season records for a rookie catcher in: games (118), average (.260), runs (48), hits (113), doubles (21), triples (7), RBI (47), and stolen bases (8)...Led all Major League catchers in triples and steals, and ranked sixth in hits...Ranked ninth among MLB rookies (sixth in NL) in total hits (114)...His seven triples as a catcher were the most by a backstop since Darrell Porter had eight in 1979...Recorded first career multi-homer game on September 8 vs. Milwaukee, with second home run being inside-the-park; was first catcher with an ITP homer as part of multi-homer game since Gary Carter (May 31, 1980 vs. STL). - Elias...Became third player in Club history with an ITP homer as part of multi-homer game (others, Hanley Ramirez, 2, Sept. 27, 2006 vs. Cincinnati, and Derrek Lee, 2, April 12, 2003 vs. Atlanta)...Set Club record with five RBI in an inning (6th) on August 12 vs. Boston, and tied Club record for most RBI in a game by a catcher (6; also, Charles Johnson - June 23, 1995 at Cincinnati)...Hit .345 (29x84) over final 25 games, with five doubles, a triple, three home runs, and nine RBI. His average led all MLB catchers over that span (from August 31, min. 89 pa)...Had his career-long 10-game hitting streak snapped on Sept. 15 at the Mets; it was tied for longest by any catcher in Club history...Set new career high with four hits on June 5 at Colorado...Became just 13th catcher (17th time) in Club history to have a four-plus hits in a game; Miguel Olivo is only catcher to have a five-hit game (June 16, 2007 at Kansas City). Made MLB debut on June 5 at Tampa Bay and had ?rst hit (two-run single) in second AB...Was hitting behind Justin Bour in lineup that day, who was also making MLB debut. In AB prior to Realmuto's ?rst hit, Bour recorded his ?rst MLB hit with an in?eld single. They became ?rst position players to record ?rst career hits in back-to-back PA since Joe Inglett & Ryan Garko with Cleveland on July 1, 2006...Had three stints with Marlins: June 1-18, July 25-28, and September 13-season...In Game 2 of doubleheader on Sept. 26 at Washington, recorded ?rst career XBHs (2b, 3b) and set career highs in hits (3), RBI (4) and runs scored (2)...Earned Marlins' Minor League Player of the Year honors after leading Double-A Jacksonville with .299 (112x375) regular season batting average. Including postsea-son play, posted .302 (121x401) mark...Regular season batting average ranked eighth in Southern League...Led Suns in average and stolen bases (18), and ranked second in hits (112), doubles (25) and total bases (173)...Batted .346 (9x26) in postseason play as Suns won SL championship; recorded a hit in all seven games, with 10 runs, four doubles and three RBI...Was batting just .189 over ?rst 10 games of season with Jacksonville before seven-game hitting streak from April 15-24 raised season average to .333...Batted .538 (14x26) during that streak, with three three-hit games, three doubles and eight RBI...Recorded season-high four RBI on August 20 vs. Pensacola...Had season-long nine-game hitting streak from July 22 to August 3 (.275/11x40, 4 r, 2b, 5 rbi)...Had season-high four hits on May 26 vs. Montgomery, matching career-high (4x)...Best month of season was May, when he batted .301 (28x93) in 25 games, with nine doubles, three triples, two homers and 16 RBI...Batted .358 (43x120) with runners in scoring position and .365 (19x52) with runners in scoring position with two outs. Spent entire season with Double-A Jacksonville, where he earned Southern League Midseason All-Star honors. Batted .230 (61x265) prior to All-Star break, with 16 doubles, two triples, three home runs and 23 RBI, with 25 walks to 49 strikeouts. Following break, batted .262 (27x103) with five doubles, a triple, two homers and 16 RBI, with 11 walks to 19 strikeouts. Best month of season was June, when he batted .293 (24x82) in 24 games, with six doubles, a triple and nine RBI, and posted a .355 on-base percentage. Batted .273 (3x11) with bases loaded, with a double, home run and 10 RBI. Grand slam came on July 14 vs. Mobile in an 8-0 win. His four RBI in that game set a season high, which he tied on August 18 at Chattanooga. Had season-high four hits on April 17 at Pensacola (4x6, 3 r, 2b), and again on July 29 vs. Chattanooga (4x5, 3 r, 2b, hr, 2 rbi). Had season-long eight-game hitting streak from July 10-21 (.294/10x34, 3 2b, hr, 7 rbi). Ended season on a five-game hitting streak (.333/7x21, 3b, 3 rbi). Spent entire 2012 season with Single-A Jupiter, earning Florida State League Midseason All-Star honors. Batted .256 (55x215) prior to FSL All-Star Game, with 30 runs scored, six doubles, four home runs and 24 RBI. Also, walked 22 times and struck out just 28 times, and had 11 steals in 15 attempts with a .331 on-base percentage. Best month was June, when he batted .294 (25x85) in 23 games, with 16 runs scored, a double, two home runs, 14 RBI and a .364 on-base percentage. Had season-long 10-game hitting streak from June 8-21. Batted .310 (13x42) during streak, with six runs scored and five RBI. Recorded 36 multi-hit games, including six three-hit games. Following the season, batted .222 (8x36) in 14 games for Phoenix in Arizona Fall League. Had a home run and four RBI, walked seven times to 10 strikeouts, and had a .349 on-base percentage. Spent 2011 season with Single-A Greensboro, where he had three hitting streaks of seven-or-more games. Season-high streak was nine games, from April 28-May 11. Batted .357 (10x28) during streak, with three doubles and two RBI. Also had seven-game streaks from May 25-June 19 and July 26-August 2. Had season highs of four hits, two home runs and six RBI on August 23 vs. West Virginia. Batted .269 (36x134) with 12 runs scored, seven doubles, two triples, 13 RBI, a .342 on-base percentage and a .351 slugging percentage in 40 games in first half of season. In 56 games during second half, batted .299 (64x214) with 34 runs scored, nine doubles, a triple, 12 home runs, 36 RBI, a .351 on-base percentage and a .519 slugging percentage. Made professional debut for Gulf Coast League Marlins on August 16, 2010. Went 1x3 with a run scored in debut vs. GCL Astros. July 12, 2018 Miami Marlins activated C J.T. Realmuto from the paternity list. July 9, 2018 Miami Marlins placed C J.T. Realmuto on the paternity list. April 17, 2018 Miami Marlins activated C J.T. Realmuto from the 10-day disabled list. April 14, 2018 Miami Marlins sent C J.T. Realmuto on a rehab assignment to Jupiter Hammerheads. March 29, 2018 Miami Marlins placed C J.T. Realmuto on the 10-day disabled list retroactive to March 26, 2018. Lower back contusion. April 13, 2015 Miami Marlins recalled C J.T. Realmuto from New Orleans Zephyrs. March 18, 2015 Miami Marlins optioned C J.T. Realmuto to New Orleans Zephyrs. September 13, 2014 Miami Marlins recalled C J.T. Realmuto from Jacksonville Suns. July 28, 2014 Miami Marlins optioned C J.T. Realmuto to Jacksonville Suns. July 25, 2014 Miami Marlins recalled J.T. Realmuto from Jacksonville Suns. June 19, 2014 Miami Marlins optioned C J.T. Realmuto to Jacksonville Suns. June 1, 2014 Miami Marlins recalled J.T. Realmuto from Jacksonville Suns. March 12, 2014 Miami Marlins optioned C J.T. Realmuto to Jacksonville Suns. November 20, 2013 Miami Marlins selected the contract of J.T. Realmuto from Jacksonville Suns. August 16, 2013 J.T. Realmuto roster status changed by Jacksonville Suns. August 7, 2013 Jacksonville Suns placed C J.T. Realmuto on the 7-day disabled list. Fractured right thumb. April 4, 2013 C J.T. Realmuto assigned to Jacksonville Suns from Jupiter Hammerheads. January 28, 2013 Miami Marlins invited non-roster C J.T. Realmuto to spring training. April 5, 2012 J.T. Realmuto assigned to Jupiter Hammerheads from Greensboro Grasshoppers. March 7, 2012 C J.T. Realmuto assigned to Miami Marlins. June 18, 2011 J.T. Realmuto roster status changed by Greensboro Grasshoppers. June 1, 2011 Greensboro Grasshoppers placed C J.T. Realmuto on the 7-day disabled list. Left hand laceration. April 7, 2011 C J.T. Realmuto assigned to Greensboro Grasshoppers from GCL Marlins. August 16, 2010 J.T. Realmuto assigned to GCL Marlins from Florida Marlins. August 15, 2010 Florida Marlins signed C J.T. Realmuto.